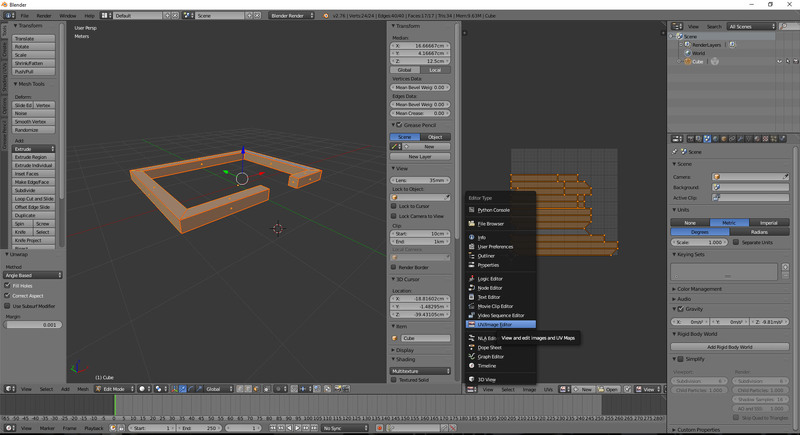 I thought I would try to make a (hopefully) straight forward tutorial for anyone wanting to get a model into banished. 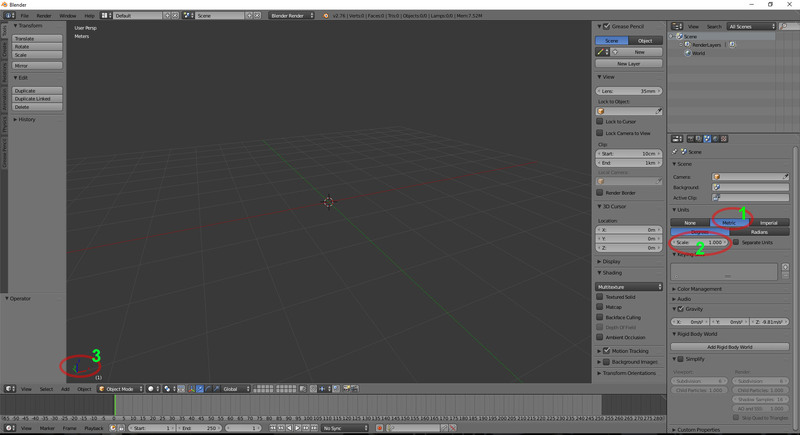 I'm using Blender 2.76, this a free open source program, updated often you can download lastest version for free here. tab = change between Edit / Object mode. shift + A = Add a mesh / a shape predefined or adjustable. 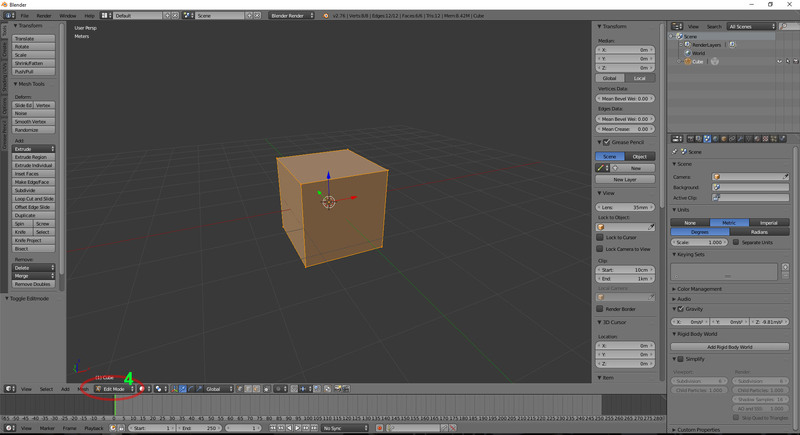 L + hovering cursor over vertex/edge/face = Select Linked, selects vertices attached. I will also upload all code and source code, as well as a .pkm version for those who just want to play I hope to inspire a lot of would-be modders. Setting the measurement system and scale to metric will mean that a square in Blender will represent a game tile square in Banished. Orientate your view so that the Y-axis travels away from you (3) – this is your North point in the game. Also ensure you are in 'Object Mode'. Press Tab to enter into 'Edit Mode' (4). Click on 'Face Select' (5), and then click on the icon next to it 'Limit Selection to Visible', this will allow you to see through the now semi-transparent faces for easier editing. Press A key to deselect the cube. Now select only the lowest face, and in the 'Transform' window pane, change the Median Z: to 0m (6), this will bring the bottom of the cube up to ground height. We are going to make a house with a footprint of width 4 x height 3 + road, to sit in a 4x4 plot. This will be the stone foundation. rotating your view , and holding shift while selecting the individual faces of the underside of the foundation, press delete, and press Delete – Faces. 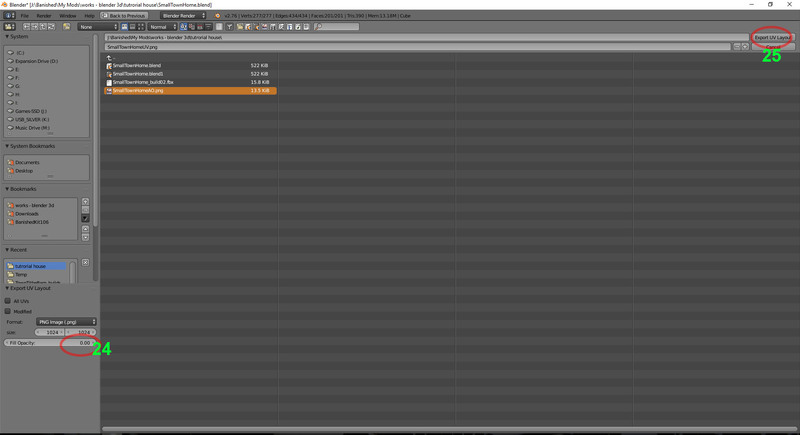 Press A to select all again, then press U to bring up the UV mapping menu and click on 'Unwrap'. Now we need to bring up another view with the UV map on it. 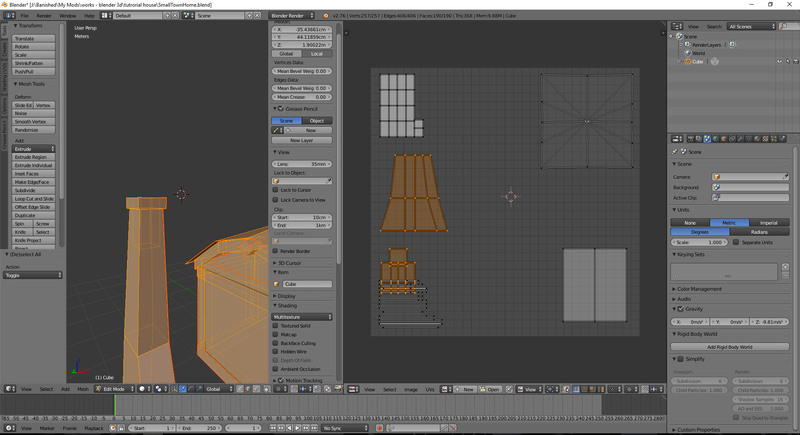 Now in this new view you will see the UV mapping that will call up the textures. 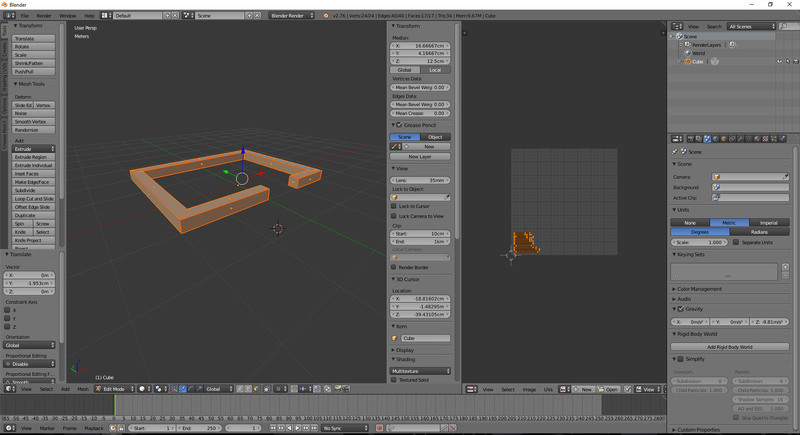 I'm going to give a quick basic tutorial, textures will be basic. In this new view, press S key and scale down the foundation faces on the UV square, and we will later create a basic texture. 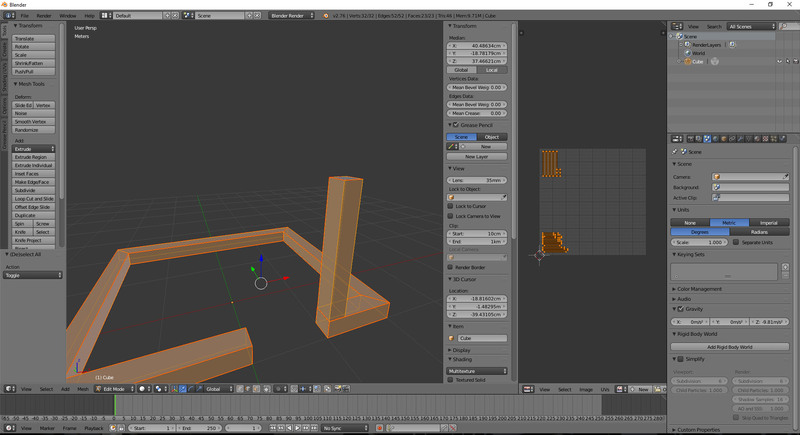 Now, back to the 3d view, we will be making the wooden frame. We will add a new mesh cube by pressing shift + A to add a new mesh-cube. Use the arrows to move it around, then press S to scale it smaller, adjust the faces to make an upright next to the doorway. 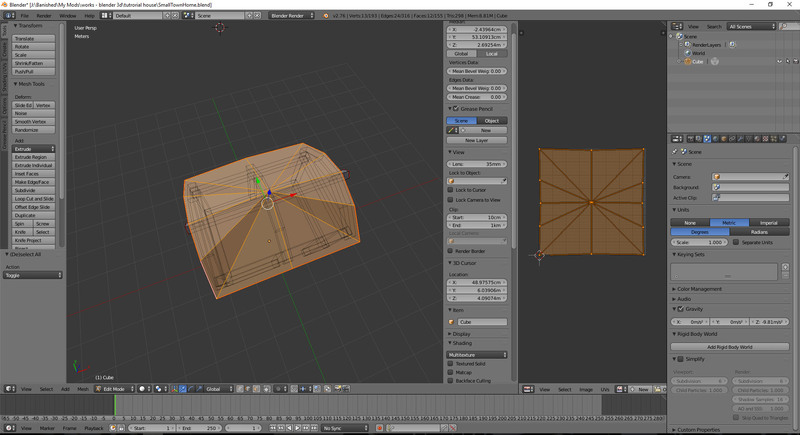 Now select only the top face, the bottom face and only one of the side edges, press ctrl = E, 'Mark Seam', hover over mesh, press L to select all connected vertices, press U, select 'Unwrap'. 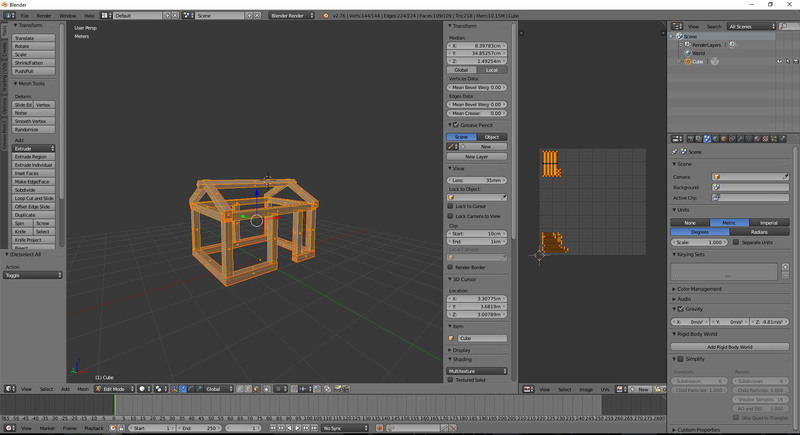 Now back to the 3d view, we will deselect all, then only select the wooden frame upright we just created (hover over press L to select all connected vertices). 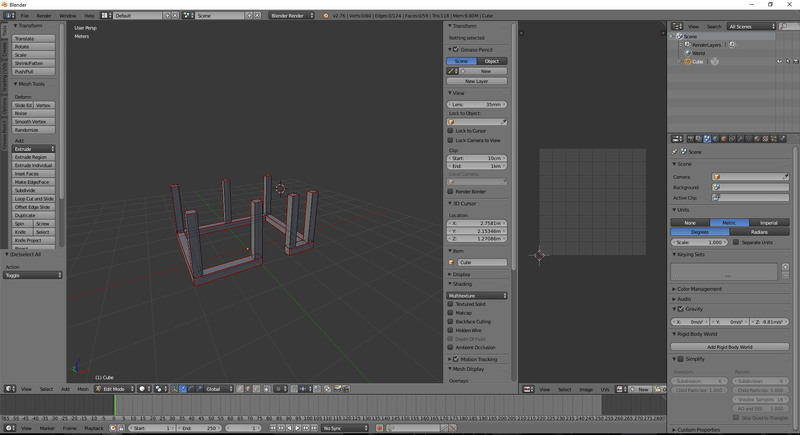 Press shift + D to duplicate, move each duplicate around the foundation to create the houses uprights for its frame. 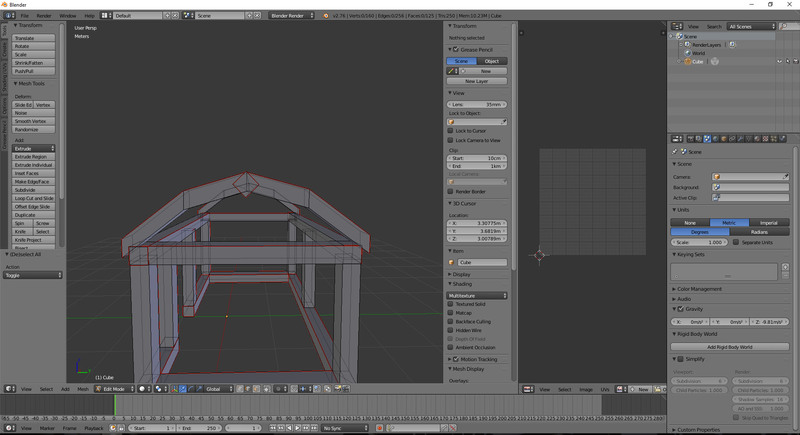 Create a duplicate of one of the trusses, move to the centre of your frame, to create a centre truss. Next, click on 'Object' (11), then 'Apply' (12), then 'Location' (13), again: Object, Apply and then this time 'Rotation & Scale' (14). 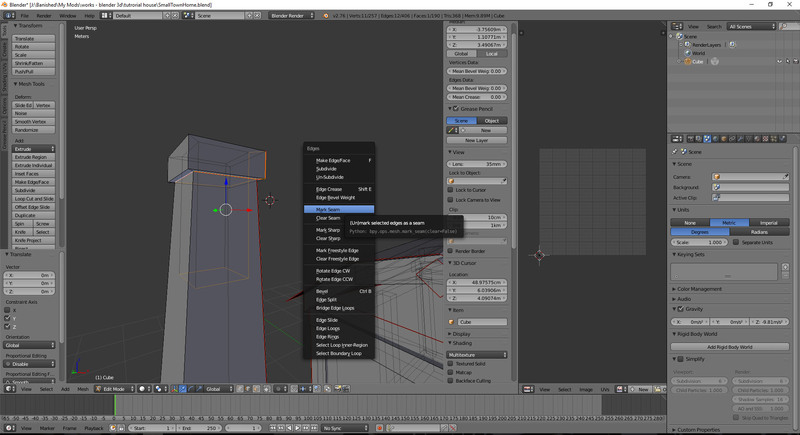 Save your project as a blender file. 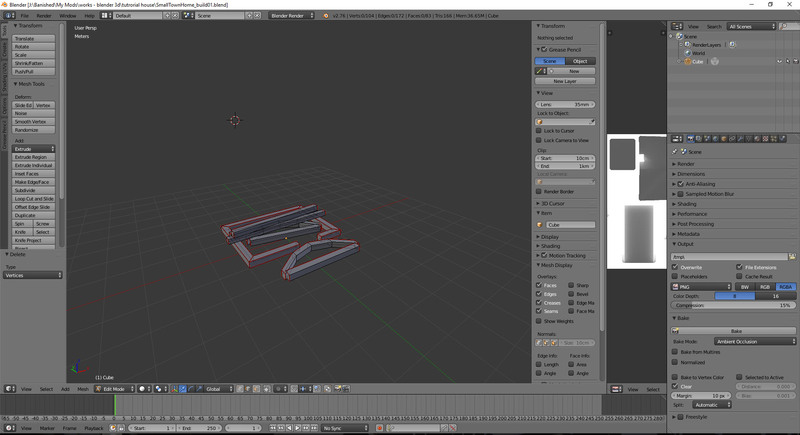 In part 2 we will finalise the 3d model. First we will add the roof and walls. 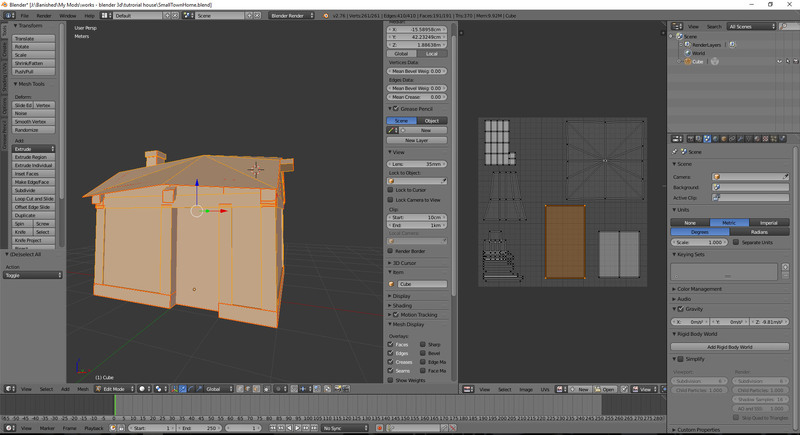 Back into 'Edit Mode', add a new plane (press Shift + A, select Plane), move it into place over the centre of the house frame. Select all the edge lines of the roof piece we just made. 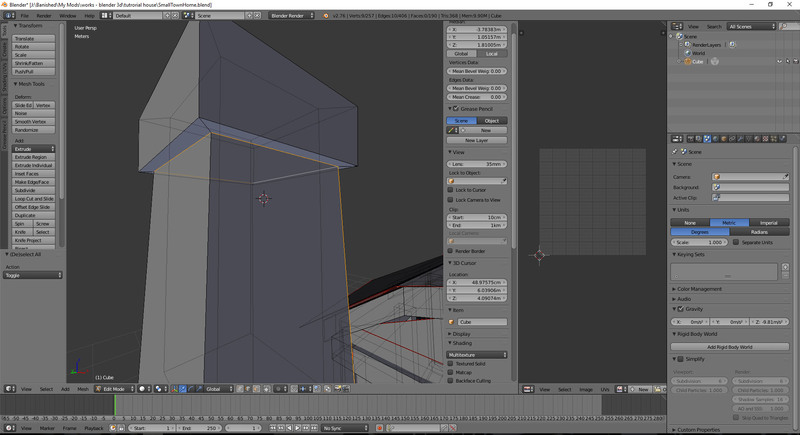 Now mark the seam of this wall and unwrap like we have done before scale and move the wall in the UV view to the bottom right. Continue duplicating (shift + D) this front wall and fill up all the sides of the house. By doing this, like we did with the Wooden frame, all of the walls will grab the same texture. Fill up most of the holes between the walls and roof by using all you've learned. Utilising the 'Loop Cut and Slide' tool (10), as well as the 'Knife' tool (13) will help you to split faces and then move edges around to fill in the gaps. Once done we will add a chimney to the building. 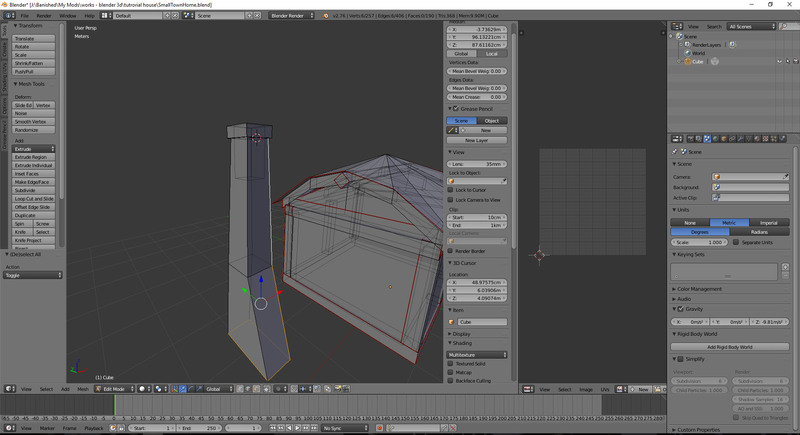 Delete the ground face on the chimney, deleting faces that are not visible is good practice to keep the poly count low. 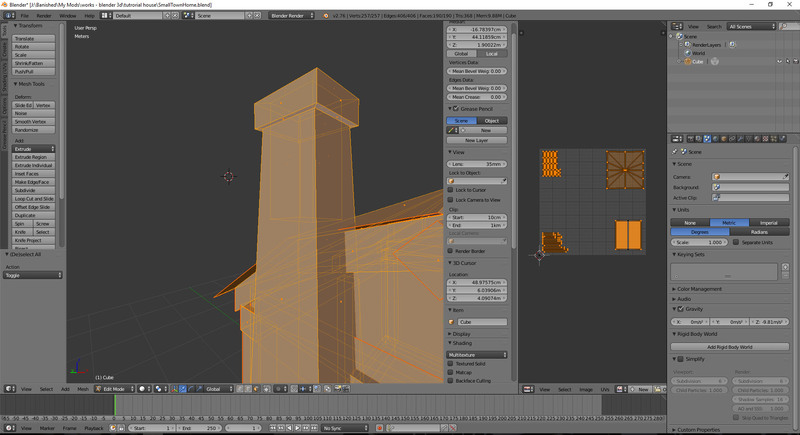 Select all of the chimney (press L to select all connected vertices), move it back away from the house so we can UV unwrap it easier. Now zoom in and only select the edges that run around the bottom of the chimney 'lip'. 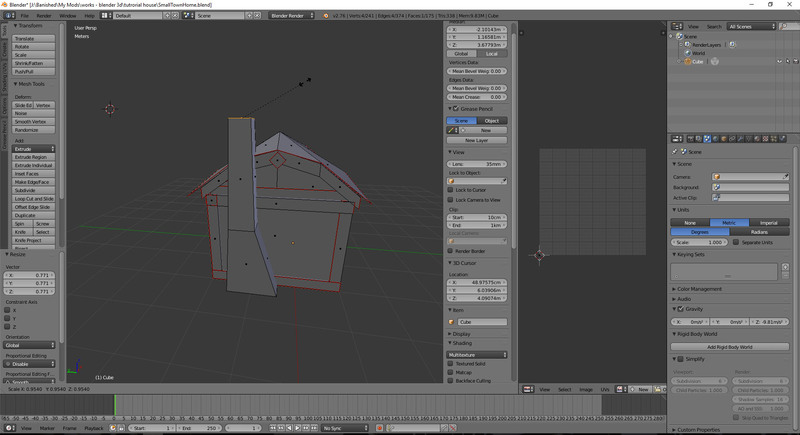 Mark the seam, and then select all of the chimney, and press U to Unwrap the chimney. I have moved the chimney lip to a place that overlaps with what will be the foundation texture. 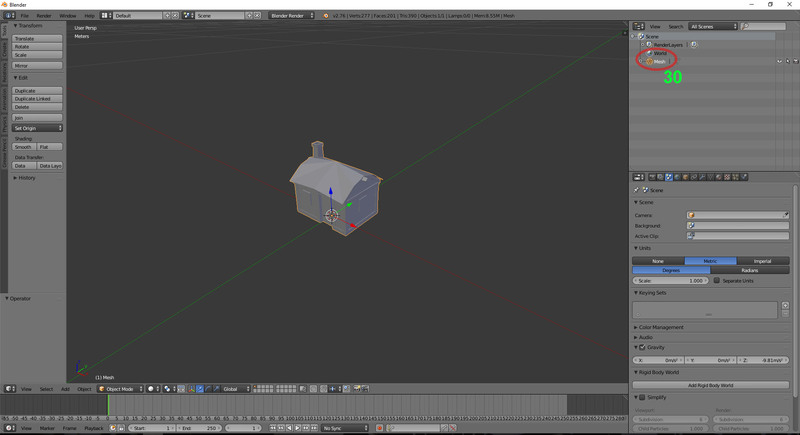 Back into the 3d view, select only the chimney and bring it back next to the house. 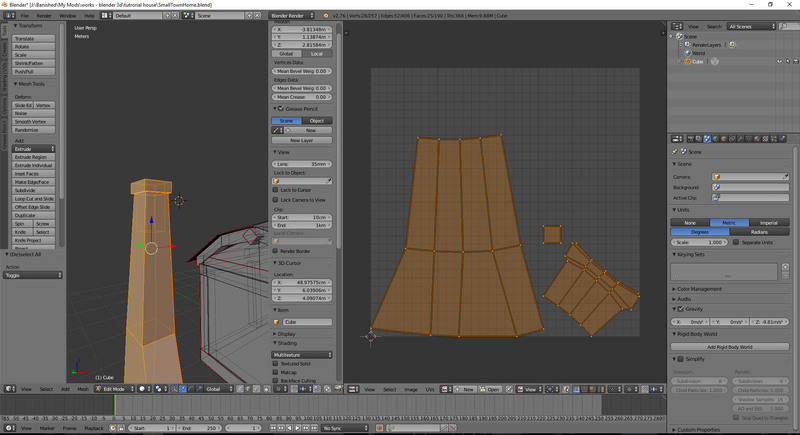 Unwrap, and adjust on the UV map. I have moved the sides of the window to the same spot as the wooden frame to share the same wood texture. Select the window and then move it into the wall next to the door, I also duplicated it and added another window on the side wall. So that is going to be our basic house model. In part 3 we will be adding the (AO) Ambient Occlusion, creating the texture file, the build models and adding the points. We add this to stop light shining through the bottom of the house when new bake the AO. Select the house model, and in the properties window select 'World' (15), then activate 'Ambient Occlusion' (16), adjust the 'Gather' sample count to 10 (17). Now in the houses 'Edit mode', select all, and then in the UV view, click on 'Image' – 'New Image', keep all the default settings, and size of 1024x1024. Press okay. Now click on the 'Bake' button (21). The ambient occlusion will have been 'baked' on this new image, you will see the effects in the UV view. Press 'Image' – 'Invert' – 'Invert Image Colors' this will make the AO image have a predominantly white appearance, need to work with Banished. 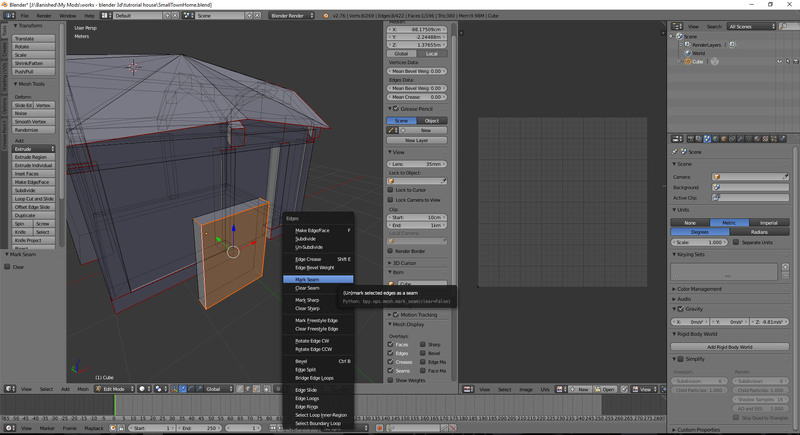 Back in the UV view, click on 'UVs' - 'Export UV Layout' – change the 'Fill Opacity' to 0.000 (24). 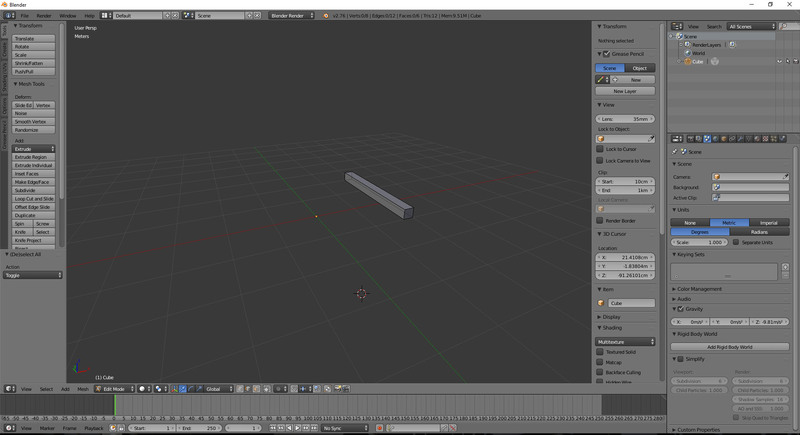 Enter into 'Object mode', select the plane we made just prior to baking the AO, and delete it as it is no longer needed. Now open up your SmallTownHomeUV.png image in a Image Editing program, I am using Adobe Photoshop, but there are plenty of others (and free ones) that can be used. Put your textures into separate 'Layers' for easier editing..
Before saving I hide the UV lines, then I save the image as a .png format (SmallTownHome.png). Load up your .blend model of the house if not already. 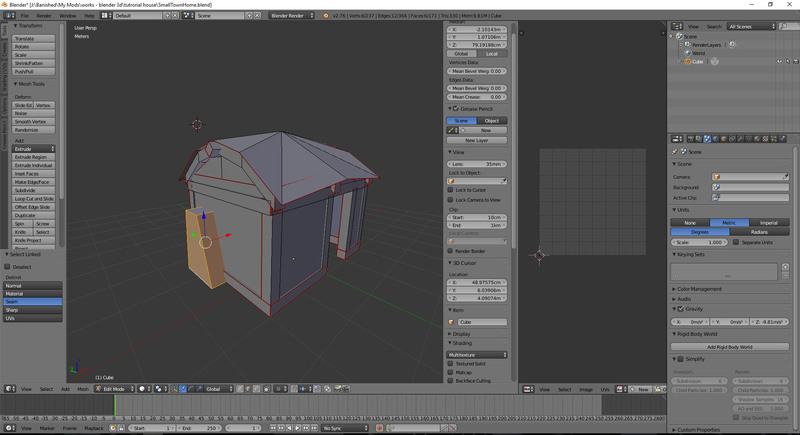 and now for what I think the fun part is.... making the build models. 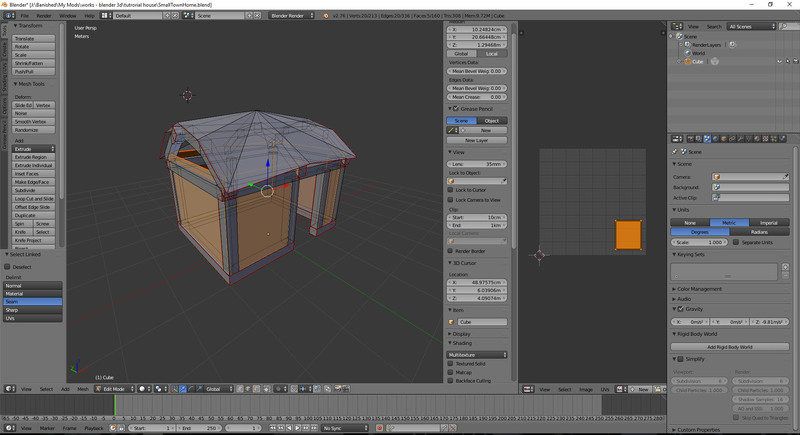 From here I save again (as SmallTownHome_build02.blend), then I export this an .fbx like we did earlier. Delete more, or move things around like they have just gotten to building site. 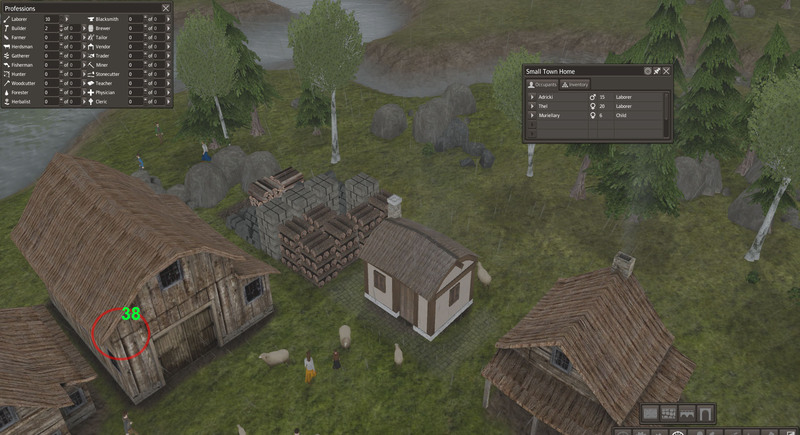 Build 01 is what you see after the resources have been taken to the houses footprint. 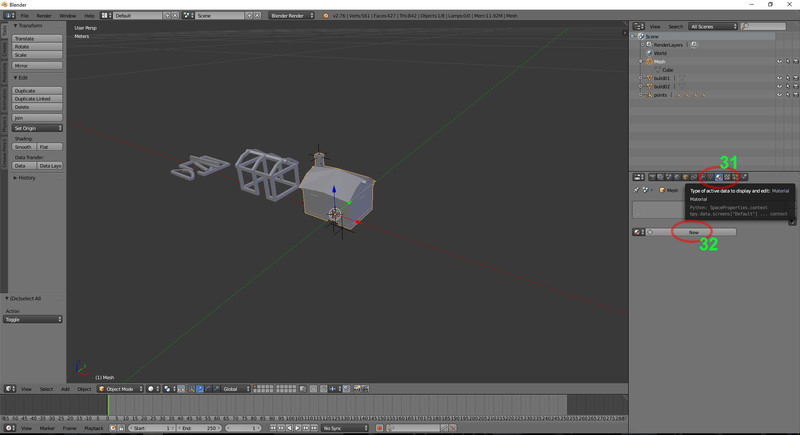 Build 01, saved and exported as an .fbx file also. 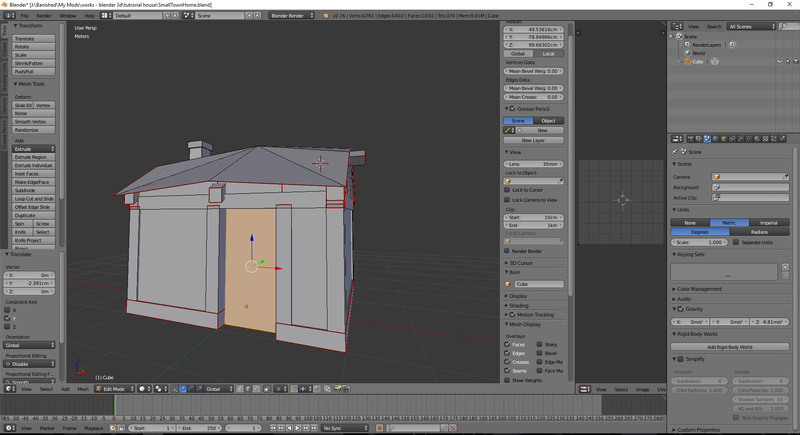 Now that all of our models are made, we can reopen up the complete house .blend save. We now need to add 'points' for the game to interact with the building. 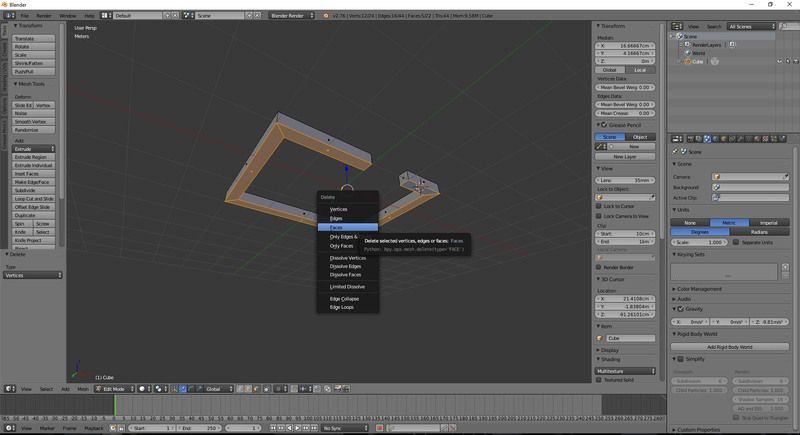 Using the 'Transform' properties menu window, orientate this so it is at 0,0,0 (26). Now add in a new point, this time it will be called 'smoke', move it so that it is sitting within the chimney slightly, set it's parent to 'points'. 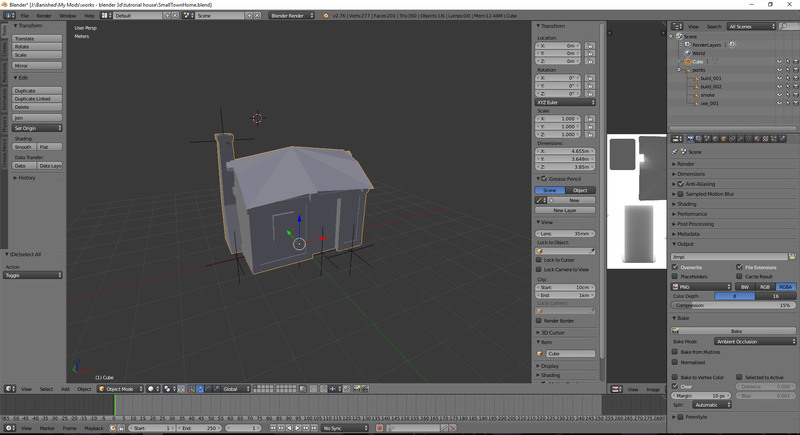 Now delete the house mesh object, so you will only have the points. It is a good idea to try to familiarize yourself with the basic ways in which a mod needs to be put together. 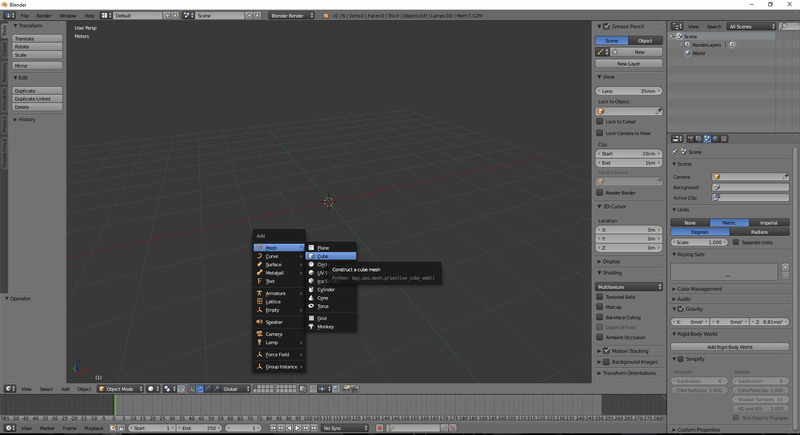 Taking a look at the examples in the mod kit and within the resource folder to see how elements of the game works. 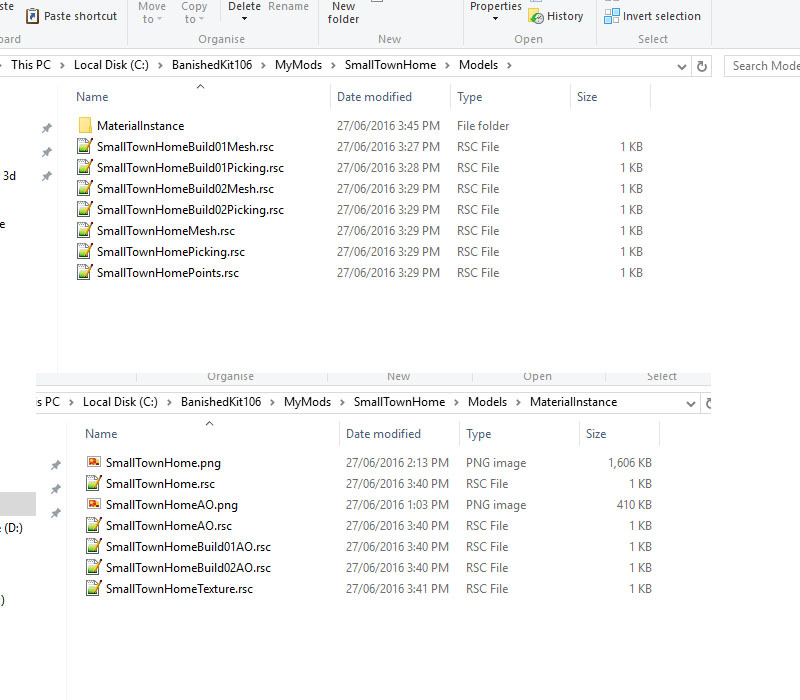 Within this 'SmallTownHome' folder I will create more folders and copy files from the example mods as well as from the resource folder. Out of the Apiary/Models example folder, copy all the .rsc files named with Apiary.... leave the one named honeyMesh, this is not needed. Copy these into your own Modles folder. 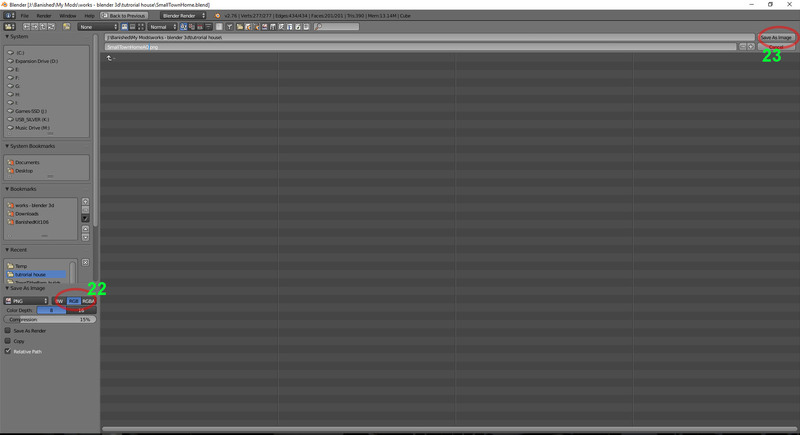 Time to start altering these files so they will link to what we're making. Then open up each file in notepad, and do the same for all the instances that it says 'Apiary'. 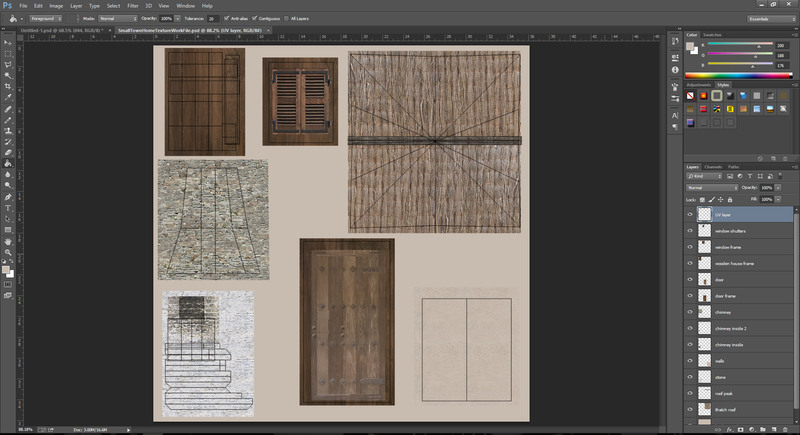 In it put the .png files we created – the texture rile and the AO image. Don't need the UV image. Again from the Apiary example folder, copy the .rsc files from this folder that are concerned with the Apiary only, except for the one concerning the ApiaryFootprint, we don't need these. From the resource/Template folder, copy the 'Woodhouse.rsc' file, put it into your own template folder. 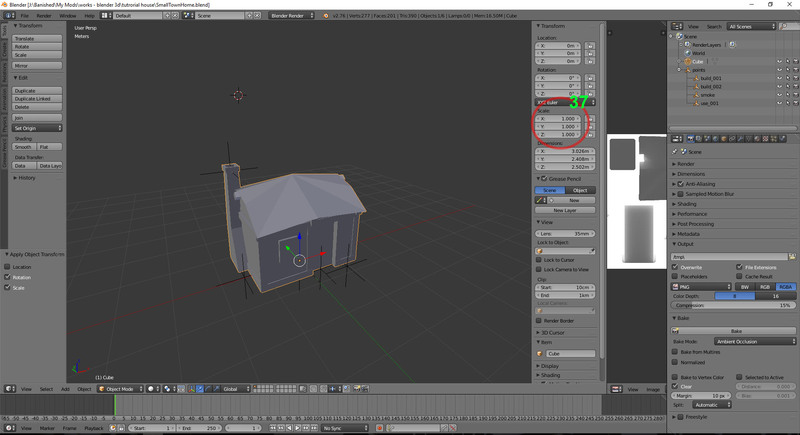 This is the section that makes all the connections for the menu button, icons and text regarding the house. This is the section that controls how the house sits on the game tiles. the placeBitArray, is what the placeBitmap is calling up info from. so when we have the 0's listed, it is saying it is an Obstacle (building) that can be placed on Normal (level) terrain. While the 1's mean it can have a road travel on the tiles, though it is still an obstacle so cannot have another building built there. Now we change the next part the map description. The other section is what for the display on the overhead game map. Thanks goes to Kralyerg for giving me insight into how the placeBitArray and placeBits work. Next we will change the rest of the template file to link up to the model and materials. A fair bit will need to be deleted from the woodhouse.rsc as it has many F-key variants. These are the sections that handles the stone house upgrade, not needed for this house. 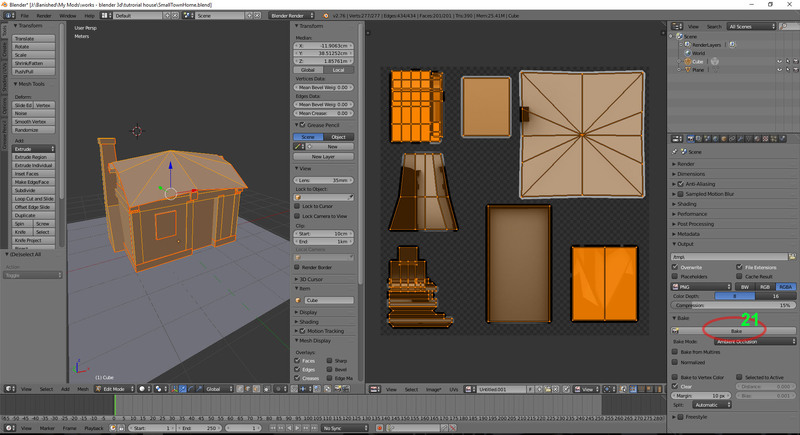 From the Apiary example folder, copy the 4 .rsc files in the Texture folder, put them into your own. Done. Now again from the Apiary example folder, copy the 4 .rsc files in the UI folder, put them into your own and then alter the filenames, again substituting 'Apiary' for 'SmallTownHome'. This is what calls up the individual toolbar icon for the house. Now we need to create the Toolbar icon, it needs to be a 32x32 png image with a transparent background to match the other icons. Once made it needs to go into a folder called 'Sprite' within the UI folder. 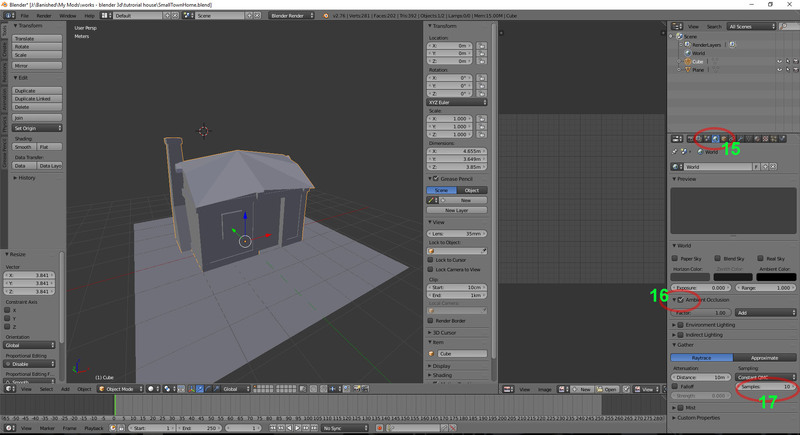 This file is the toolbar file- it controls where the houses icon will be. this is the mod kit’s 'call up' sheet for when compiling the mod. Now edit the Package file, this is what controls the information that is shown in the game mod menu and in the steam workshop. String _description = "This is small home with the same numbers of the Wooden House. Next make the icon.png file it is asking for. This needs to be 48x48. I just resize the toolbar build icon. Don't worry about the preview.jpg, as we haven’t got an in game shot yet. 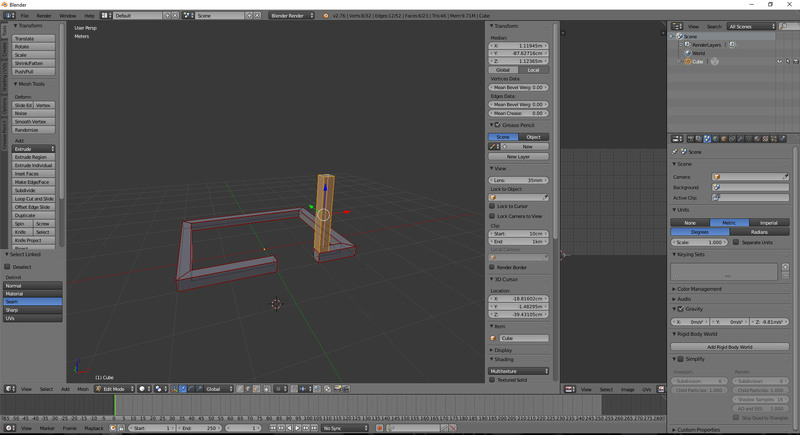 Now we must make the single .fbx file that the game will read from. The house should have been imported and you will have to zoom in a long way to see it. 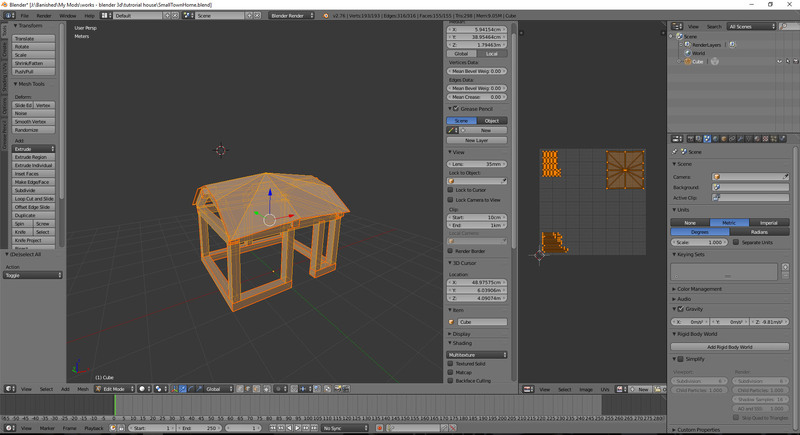 Import the build models one at a time in the same way, they should also fall directly into the centre of the house, if not they were not exported properly at 0,0,0. Press 'Open' (35), and link to the SmallTownHome.png file in the MaterialInstance folder. 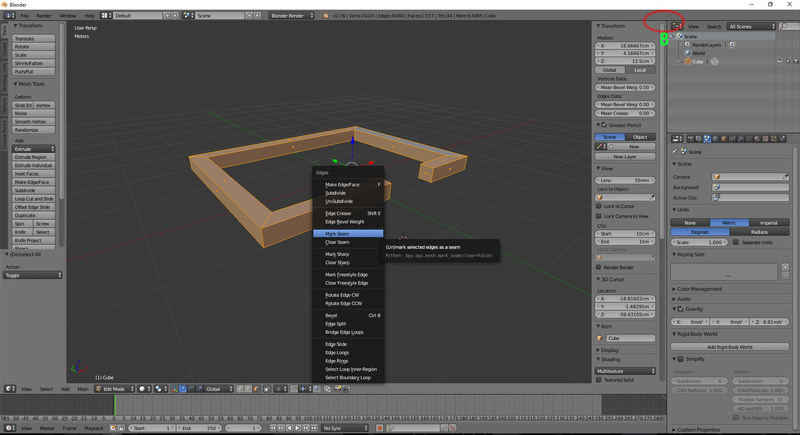 Now click on each of the build models and call up the same texture, only this time you only need to click on the 'Material' tab, and instead of adding a new material, just click on the 'SmallTownHome' material we had just made. Just click on the little globe/circle, and select the material. 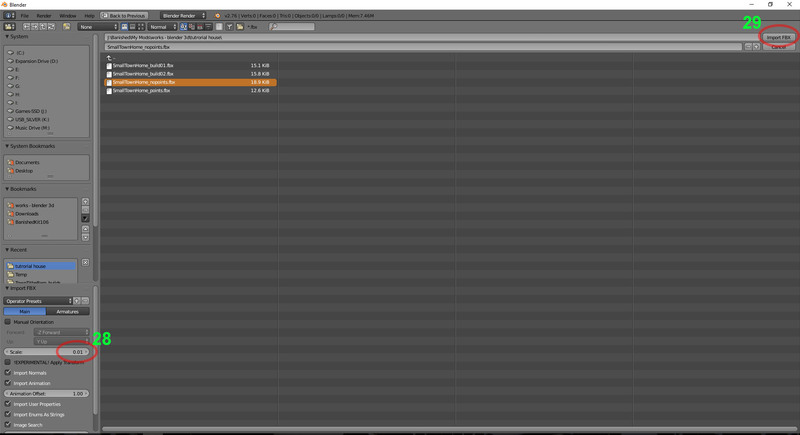 Now it is ready to export again, this time as a single .fbx file. Now we can build the model! You will be prompted if there is an issue. I then double click on the 2 Run.bat file and the game loads up. Start a new game. The model loads up fine in game, but it is too big ! .... 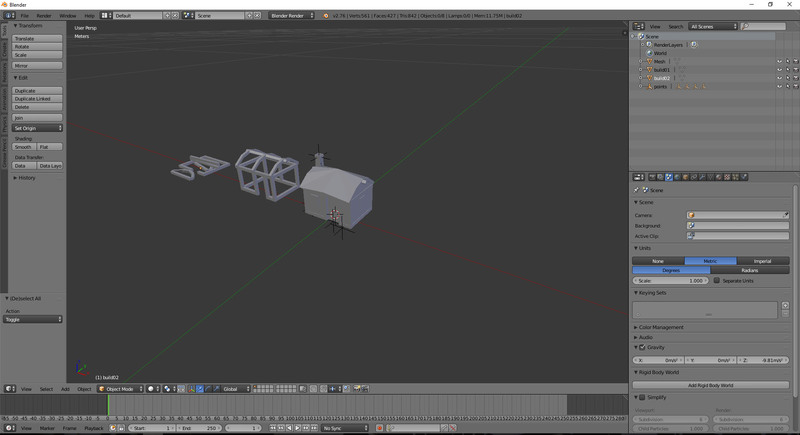 In Part 6 we will resize the models and make it fit on a smaller footprint. 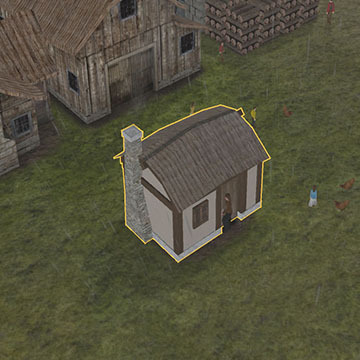 So our house model is way too large inside the game, looking at the picture in game, we could easily take one square off the side, so it will be a smaller house sitting on a smaller footprint of 3x3 instead of 4x4. Do the same for the points holder (it will resize all points). We now have a house scaled to 65% of what it was. It takes up approx. 1.5 squares either side of the Y-axis. Important, we now need to 'Apply' these changes to the scale. 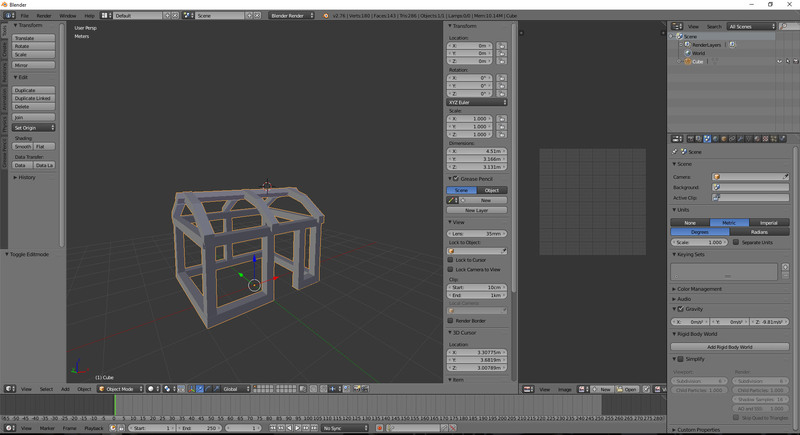 Now like we did earlier, delete the house mesh, and export only the points as an .fbx file (at scale 1.000). 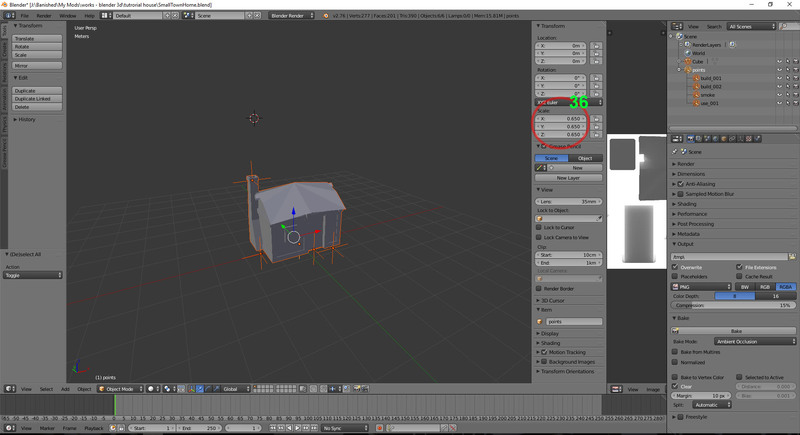 Reload the house save, this time delete all the points (all points can quickly be deleted by 'right-clicking' on the 'points' holder in the Outliner window pane [top right of my blender view], and click on 'Delete Hierarchy'). Now export the house only as an .fbx. 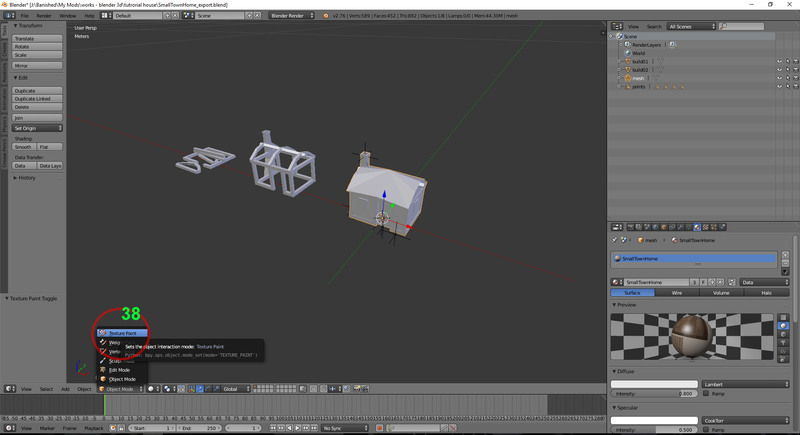 Now load up the build01 & build02.blend saves we made earlier, and make the same changes in scale that we made to the complete house, apply the scale, and save and export as .fbx's. And again following the same method we did in Part 5, we will start a new empty Blender project and import the .fbx files one at a time at 0.01 scale. 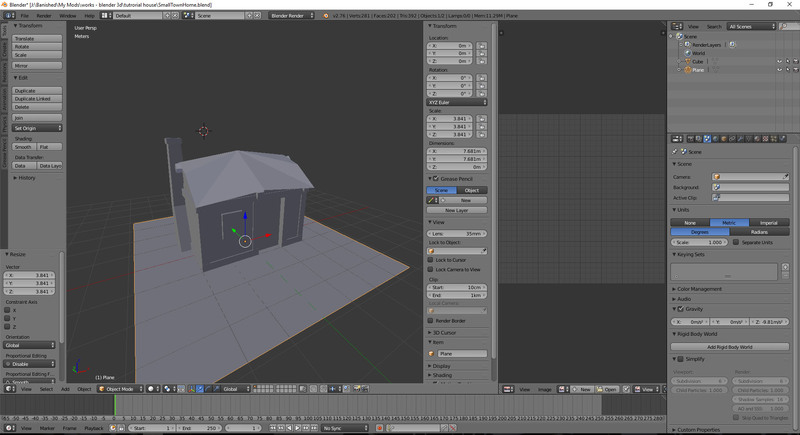 If you want, you can press on the 'Object mode' button (38), press 'Texture Paint' and it will show up the house with the texture you just assigned. 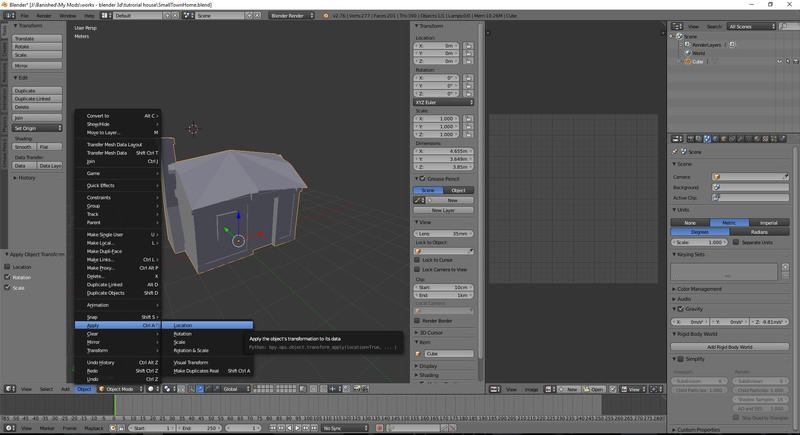 Once you've assigned the materials, export all as an .fbx, and replace the SmallTownHome.fbx you created in the Models folder. 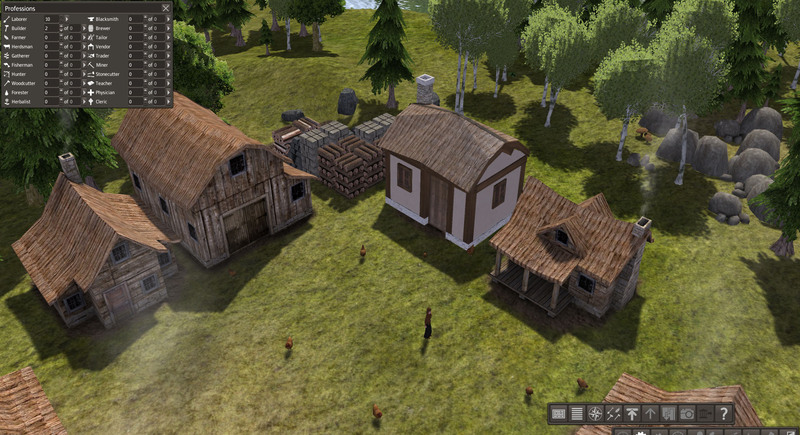 Open up the SmallTownHome.rsc file in the Templete folder. We have now changed the house to sit on a 3x3 footprint including the road. Now recompile the mod (delete the 'bin' and 'Build' folders first) by clicking on the '1 Build.bat' file. Run the mod by clicking '2 Run.bat'. I guess we will find out in Part 7! … I was hoping to have this finished by now. But problem solving is the best way to learn. Thanks to @kid1293 , we now know that the particle system needs to call up the points.rsc file directly from its code in the template file. just that added 'PointList _pointList = "Models\SmallTownHomePoints.rsc";' line will make the chimney point act as it should. Now rebuild the mod with these added changes, and lastly package the mod. 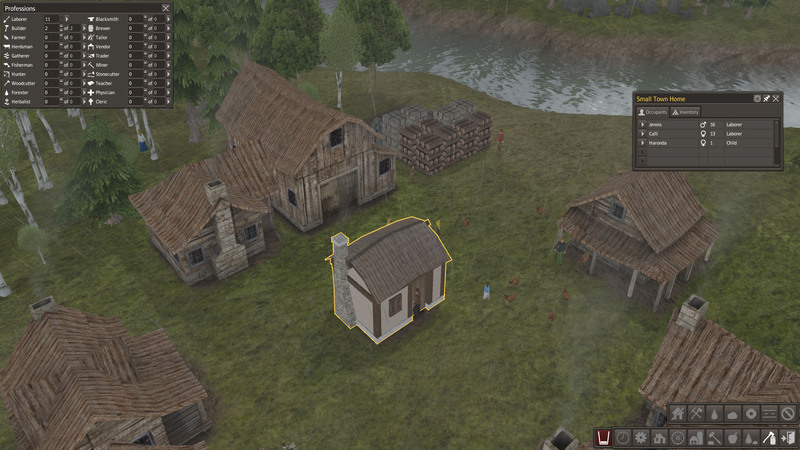 Test the mod in the normal Banished environment. Thanks for reading, any questions? happy to help. but I still hope, going through all of this might allow others to venture into the 3d modelling and Banished modding world. Keep checking back above, as we will solve the issue. I will also upload all the source files once it is operating as required. I hope that some of you will find it helpful. Great tutorial. 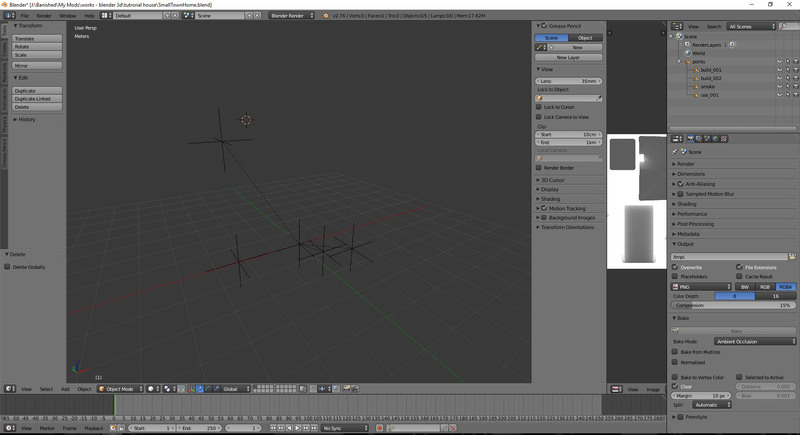 This is actually a lot better than most Blender tutorials out there - the others tend to be so needlessly complicated. Thank you for this! It makes me want to break out Blender again. I tried it once and got hopelessly frustrated with it. Just wanted to say thank you for the tutorial I use it 10 times a day as my goto model problem solving 101. 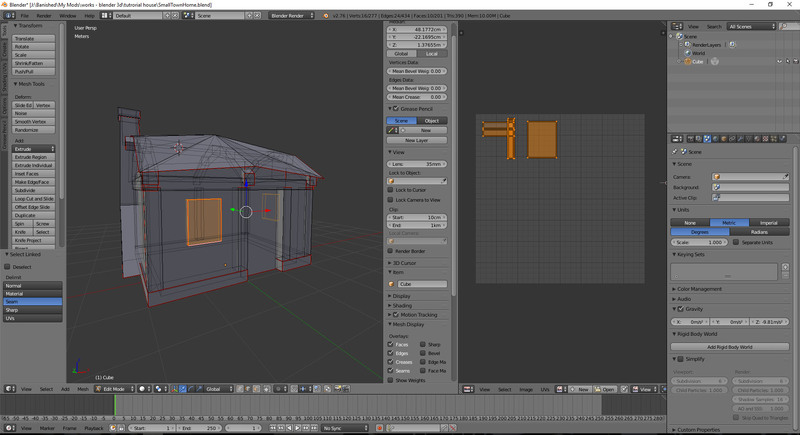 If you decide to update it at some point I hope you add to it showing more F-Key textured model variants of your smallhouse that are lined up in rows inside the same .fbx so people understand how this can be done and restructured/renamed: SmallHouse01Mesh, SmallHousepoints, SmallHouse01Build01, SmallHouse01Build02. 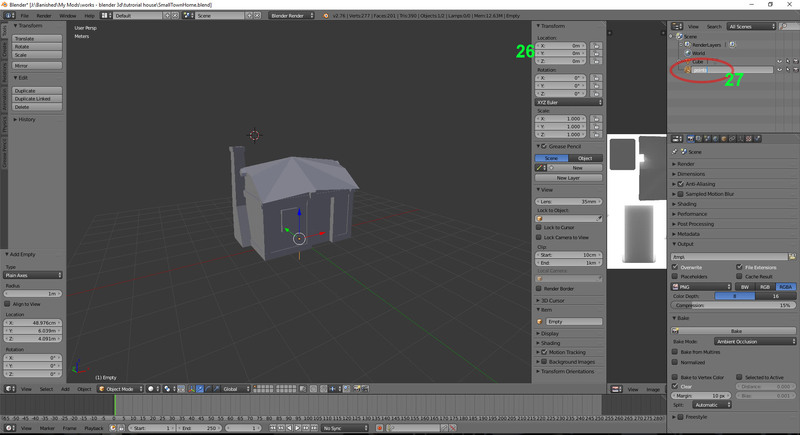 if happends to have a chimney in each model not at same place as the other models, then you need to "link" the smoke point to the mesh and not to the "points" point. and in the template, you take out the pointlist mention from the particle system function paragraph.